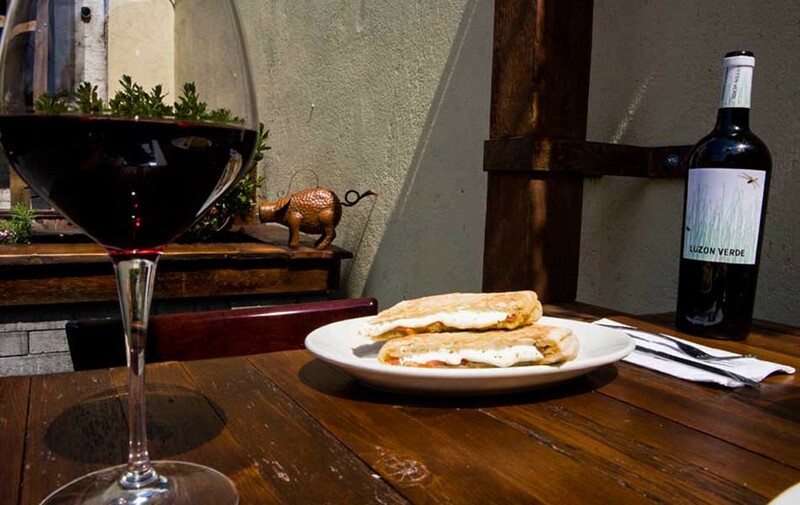 With warm weather on the horizon, IL Bambino in Astoria is ready to open their beautiful and cozy backyard dining area. Owners Darren and Melanie Lawless are also celebrating the debut of their new location in Manhattan's historic and trendy West Village. In addition to all that, next time that you stop by, check out IL Bambino's menu for some tasty and intriguing new flavors and dishes. Yes, that cute little pig, the loveable symbol of IL Bambino for so many years, has finally joined the bridge and tunnel crowd , setting up shop in the Village. Now, Manhattan residents can see and taste the crostini, Panini and tapas that won the hearts and stomachs of Astoria's foodies. The menu at the West Village location is similar to its counterpart in Queens, as is the friendly and hospitable atmosphere. At Il Bambino their culinary philosophy is keep things simple. But, that doesn't mean that you can't be creative. What is il panino Americano? It is Darren and Melanie Lawless's interpretation of what makes for a great sandwich. Mix in some delicious, locally sourced ingredients with superior meats, cheeses and tasty spreads and you've got a winning formula. The secret is in the bread. Their ciabattina bread is baked fresh every day. It's the foundation of IL Bambino's success. Il Panino Americano takes the best of Italy's Panini tradition and kicks things up a notch. The owners have also partnered up with some of the most respected farms and purveyors in the New York area, including Alps Salumi, Murrays' cheeses, Dallis Brothers coffee, Gian Piero Bakery and North Fork Farm. Most crostini options will run you around $5.50 to $6.50 and you get two squares per order. There's a crostini for every taste. The egg salad with chive oil and Fontina cheese is a great choice as is the artichoke, goat cheese and olive spread crostini. Favorites of Il Bambino's dinner and brunch crowd are the tuna fish spread with tomato pesto as well as the chorizo, avocado butter and chili oil. You really can't go wrong with any of the more than twenty Panini selections on the menu. Vegetarians adore the fried eggplant sandwich with roasted mushrooms, goat cheese and spicy mayo. Other, popular signature paninis include the Italian meatloaf, sweet sausage with onion marmalade, and the roast chicken romesco with scallions and olive spread. Brunch at the Bambino offers a wide variety of Panini with amusing names like My boyfriend is a pig, Sir oink a lot, the Italian nut job and the big booty which features mortadella, scrambled eggs, sweet pepper hash and provolone cheese. That's the wonderful thing about IL Bambino. No matter how many times you go, there is always a new, interesting dish that beckons your taste buds. Founded by master chef Darren Lawless, IL Bambino Café, located on 34th Street and 34th Avenue in Astoria, brings an authentic Italian casual dining experience to the neighborhood. The rustic décor and warm ambiance makes you feel as though you are enjoying lunch or dinner in a countryside café, nestled between the sprawling farms and vineyards of Tuscany. Il Bambino's servers will never rush you through your meal. These friendly folks allow you and your companion to relax and savor every moment of your meal, just as they do in Italy. Light and tasty insalatas include, Darren's signature one of a kind fingerling potato salad, complete with truffle aioli , fried shallots and Pecorino cheese. The Pecorino adds a little zest to the salad but, in no way, overpowers it. An intriguing choice is the baby arugula mimosa salad, with shaved egg as well as an addicting smoked bacon vinaigrette. In Italy, most of the popular artisanal cold cuts like cappa ham, pancetta, mortadella, soppressata are derived from the pig. A drawing of a cute, little pig is an important part of the IL Bambino logo. One could say that pork is the meat of the menu. Pork is everywhere, from Darren's Mortadella and McClure's pickle Panini, to the sweet sausage with onion jam ,peppers, rosemary aioli and Fontina cheese. For anytime snacking or dining, why not share an Antipasti such as the generous five cheese plate, the good for you olive bowl or the High Five, a platter filled with primo meats and cheeses. Pair one of the antipasti with a delicious soup or salad. Soup selections change with the seasons, but they are all warm and filling. You simply cannot dine at the Bambino without having Darren's signature crostini. Two to an order (you'll want more), crostini are delightful squares of fresh baked bread topped off with their unmatched selection of spreads and aioli. Top your squares with basil pesto, sun-dried tomato, cracked pepper, truffle, Fig or apricot butter and the spread it if you dare, spicy mayo. You will want to try them all. Brunch highlights include the bacon bling panini, consisting of smoked bacon, mortadella, scrambled eggs, fontina cheese and scallion aioli or the shrine to swine panini! The swine sandwich is a veritable tribute to pigs everywhere. Your panini is filled with slices of porchetta, scrambled eggs, onion jam, cracked pepper aioli and aged cheddar. They serve a great cup of gourmet coffee and their brews are fair trade and organic. What's not to like? The Bambino drink menu also includes such delights as lattes, cappuccinos, a wonderful Nutella hot chocolate, an orange mimosa and, for your brunch pleasure, fresh squeezed OJ. Il Bambino café... do you like it? You will, once you try it! After many years of traveling, making our way through the casual tapas bars of Northern Spain, and the more simple, yet sophisticated, cafés of Italy, we felt it was time to begin a new chapter in our lives and open our own café. Blending an Italian-style paninoteca with a Spanish-style tapas menu, Il Bambino’s objective is to provide customers with top produce, exceptional, but reasonably priced food, and good wine. I have been to Il Bambino 50 times and I love all the panini's. They all taste amazing.